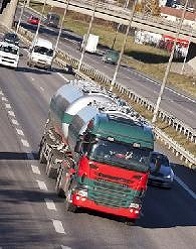 The planning of bulk transport for commodities such as milk & dairy products, cement, concrete, petrol, lubricants, food & beverages, diesel, powdered products, fuel and liquefied gases presents a challenging scheduling and optimization problem. The conflicting pressures of increased customer service expectations and maximisation of resource usage focus attention on the ability to react dynamically to changes on a minute-by-minute basis. MJC²'s award winning dynamic tanker scheduling software provides powerful transport planning tools which can schedule bulk goods transportation in real-time. In businesses where order fulfilment windows may be as narrow as half-an-hour, and penalties for late delivery may be substantial, the ability to react quickly to operational problems such as traffic delays, breakdowns, last minute orders, etc. is vital. MJC²'s real-time tanker dispatching system REACT can respond dynamically to updates from the operation (e.g. last-minute changes to orders, GPS vehicle tracking information, etc.) while maintaining strategic objectives such as improved fleet utilisation, reduced spot-hire costs and balanced use of drivers, depot employees and vehicles. Our bulk logistics planning systems are used to schedule large distribution operations which operate under tight time constraints and service level agreements, driving benefits such as reduced transport costs, strategic optimization of resource utilisation and improved adherence to schedule. REACT can dynamically reschedule tanker movements in seconds, allowing the transport plan to be continuously updated based on the latest information available. DISC creates optimized transportation schedules for bulk collection routes and delivery operations on a daily or real-time basis. Integration with our strategic logistics optimization system SLIM enables forward planning of the logistics network and capacity planning at depots and storage/processing facilities.